This is a question that comes up time and time again, because there is not a definitive answer. The specifics vary between states and even regions, but even so, we can provide a generalized answer. Here are five major differences between the two. Judges have a much higher power than magistrates. Judges usually hear larger, more complex cases, while magistrates hear about smaller cases—such as petty crime or traffic offenses. Judges can preside over larger areas, where a magistrate’s area of jurisdiction is limited to smaller areas, such as city or county. There is a different level of power given to judges and magistrates. Judges have high authority over most matters, where magistrates are given a narrow breadth of authority. Judges can render final judgement in a case, magistrates cannot. Most judges are elected for a set term, but magistrates are appointed by the judge and serve based on the judge’s wishes. 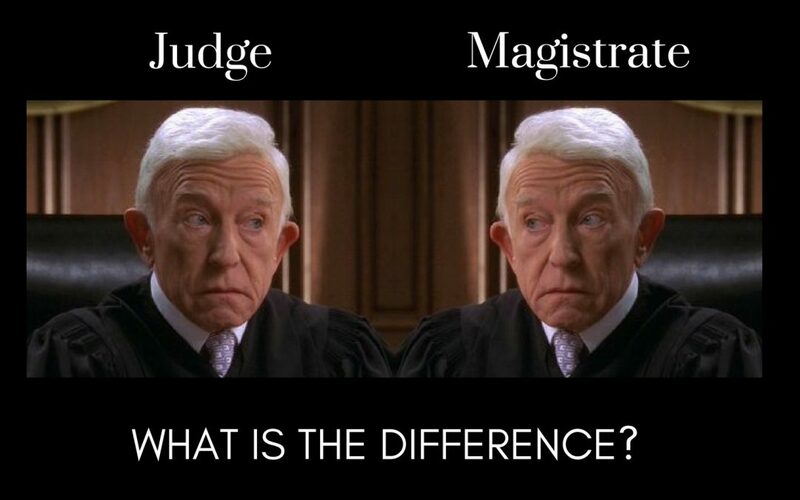 To learn about more specifics about the roles of judges and magistrates, visit your state’s Magistrate website.